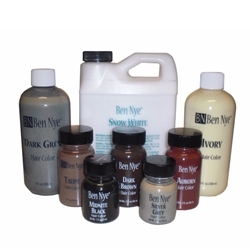 Ben Nye's famous liquid hair colors are easily applied with either a tooth brush or hydra sponge. When dry, style hair and set with hair spray. Shampoos clean. Avoid use on chemically treated hair unless you pretest on a small area. Available in the following colors: Silvery Grey, Dark Grey, Dark Brown, Snow White, Midnight Black, and Ivory. Expect 3-10 application per ounce.